Through engaging, interactive activities in a fun, safe environment, students in the youth program learn to develop concentration, self-discipline and respect for themselves and others. We trust in the potential of all children and believe young students gain confidence through the development of perseverance and a steadfast spirit. 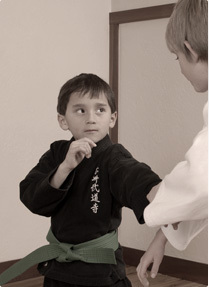 This kind of tenacity, in combination with a sound foundation in basic personal protection skills, empowers students to stand up for themselves against bullies or other aggressors and instills them with the belief in their ability to succeed in the face of adversity. Our program not only provides for activities that will lead to enhanced physical attributes such as strength, suppleness, and agility, but also the personal protection skills that will keep them safe. Just as importantly, the training inculcates the life skills that will lead them to personal success, whatever the endeavor. CAMA students develop positive character traits such as integrity, perseverance and resourcefulness. The result is confident young people insulated from unsubstantiated fear and worry, who are empowered to make decisions consistent with their beliefs, who are focused on their goals, and who grow to be independent, self-sufficient adults.